Pecies of tough, tasty grilled fish mixed with great aroma from lemon leaves, eryngium and beans dipped in sour sweet chilli sauce. It's amazing. Bring all the ingredients in a mixing bowl and mix well. Add the long beans and lime leaves, rub well and keep refrigerated. Heat the oil and deep fry fish meat until both side slightly brown colour. Take out and drain the excess oil. Heat the pan. Add soybean oil, garlic, shallot, red chilli ands tir fry until the garlic is brown colour. Add palm sugars, salt, and water then continue to boil until thick. Set aside. Once the sauce is cool down add Knorr lime Powder and mix well. 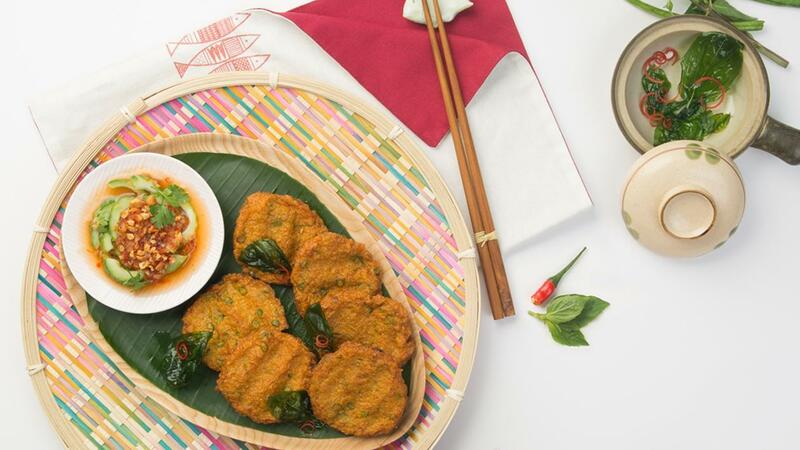 Serve fish cake with cucumber, chilli sauce and peanut as a dipping sauce. Decorate with fried basil and salad leaves.